Put your money away and learn where you can eat for free! Check out our great big list of all of the restaurants that offer free food! Keep this page book marked because we will update this list frequently with the latest offers. Also, don't forget to check out our restaurant coupon page to see this weeks latest restaurant coupons. Acapulco: Get a free appetizer with the purchase of two entrées with email sign up. Applebee’s: Enjoy a free treat on your birthday when you sign up for this restaurant’s eClub. Andy’s Frozen Custard: Sign up and register your rewards card for a free cone. Arby’s: Get a free roast beef classic with the purchase of any drink. Au Bon Pain: Get a free travel mug and discounted coffee when you join the eClub. Auntie Anne’s: Enjoy a free pretzel after your first purchase. Baja Fresh: Join Club Baja for a free taco with any purchase. Baskin Robbins: Download and register via the Baskin Robins app for a free scoop of ice cream! Backyard Burgers: Sign up for a free Backyard Classic burger. BJ’s Restaurant & Brewhouse: Register on this restaurant’s mobile app and receive a free mini Pizookie or handcrafted soda. Black Angus: Sign up for a free dessert plus a free steak dinner on your birthday. Blimpie: Get a free regular sub with drink purchase when you join the Blimpe eClub. Bojangles’: Get a free half gallon of iced tea with any purchase plus a free Bo-Berry Biscuit on your birthday. Bucca di Beppo: Join this restaurants eClub and receive a free pasta! California Pizza Kitchen: Enjoy a free small plate when you sign up for CPK Dough rewards. Plus, get a free dessert on your birthday. 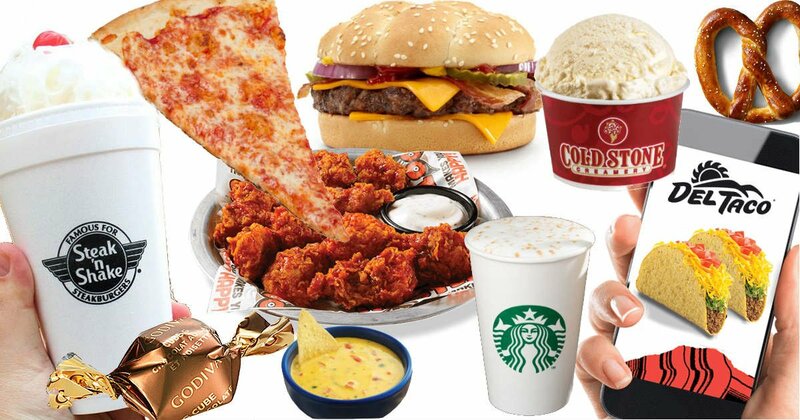 Captain D’s: Enjoy a free dessert every week for a month with email sign up! Champps Kitchen + Bar: Get a free Champps cheeseburger when you sign up for the MVP League. Caribou Coffee: Sign up for Caribou Perks and receive a free medium beverage. Carvel: Sign up for a buy one, get one free sundae coupon valid at participating locations. Checkers: Get a coupon for a free large fry with any purchase with email sign up. Cheddar’s Scratch Kitchen: Sign up for free chips and homemade queso. Chevys Fresh Mex: Join Chevys’ E-Club and receive a free appetizer with any two adult entrées. Chilli’s: Get a free dessert on your birthday with a My Chili’s Rewards account. Cinnabon: Join Club Cinnabon and receive a coupon for a free Minibon roll at participating locations. Corner Bakery: Sign up for this eClub and receive a free bakery treat. Culvers: Get a free scoop of custard plus buy one, get one free value basket. Dairy Queen: Join the Blizzard Fanclub for a buy one, get one free Blizzard coupon. Don Pablo’s: Join the Habaneros Club and receive a free order of nachos. Dunkin’ Donuts: Sign up for DD Rewards and receive a free beverage at signup and on your birthday. Earl of Sandwich: New members will receive $5 off their first order after signing up for this restaurant’s Royalty Club. Einstein Bros Bagels: Get a free bagel and shmear with purchase plus a free egg sandwich with purchase on your birthday. Firehouse Subs: Sign up for this restaurants email list, and you’ll get a free large drink with the purchase of any sub. Friendly's - First time member treats change but are typically a Free scoop, also birthday freebies for the whole family. Godiva - Free treat for members every month. Gold Star Chili: Buy-one-get one free 3 Way. Habit Burger & Grill: Free birthday treat. Hardee’s: Get a free small fry and beverage with email signup with purchase. Hooter's: 10 free boneless wings and a birthday treat. Houlihan's: $10 off with signup and free birthday meal. IHOP: Join the Pancake Revolution for a free full stack of Rooty Tooty Fresh ‘N Fruity pancakes and a free birthday meal. Joe’s Crab Shack: Snag a free appetizer when you sign up for Joe’s Catch. Johnny Rockets: Get a free burger just for signing up for this restaurant’s newsletter! Longhorn Steakhouse: Free appetizer with the purchase of one adult entree with signup. Macaroni Grill: $5 off next visit. Maggiano's: $10 off next visit. Marble Slab Creamery: Get free ice cream just by downloading the app! McDonald’s: Get a free sandwich when you download the app and use mobile pay on any order of $1 or more. Mimi’s Cafe: Get a free 2-pack of croissants or muffins with email signup. Moe’s Southwest Grill: Get a free order of nachos with any regular drink purchase plus get a free burrito on your birthday! O’Charley’s: Get a free appetizer when you sign up for this restaurant’s O’Club. Olive Garden: Join the Olive Garden eClub for a free appetizer or dessert with the purchase of two adult entrees. On The Border: Join Club Cantina for free queso or sopapillas on your first visit. Panera: MyPanera rewards members can get a FREE bagel loaded onto their account & treat for signup. P.F. Chang's: 1000-point bonus (2,000 for free entree) - Bogo free entree offers every week. Perkins Restaurant & Bakery: 20 percent off and birthday treat. Pizza Hut: Free Cheese Sticks with your next order. Pizza Inn: Get a free medium chocolate chip Pizzert or 5 pepperoni twists with email signup. Quiznos: Download the Quiznos Loyalty app and receive a free 4″ sub with any purchase. Red Lobster: Sign up for a free appetizer or dessert with the purchase of two adult entrées. Red Robin: Join Red Robin Royalty to get a free birthday burger. Rubio’s Coastal Grill: Sign up for the Beach Club and receive a free taco! Ruby Tuesday: Get a free appetizer worth up to $10 with the purchase of one adult entree and free burger on your birthday. SBARRO: Join The Slice Society to get a free XL NY slice with purchase of a beverage. Schlotzsky’s Deli: Get a free small Original just by downloading this restaurant’s app. Sizzler: Join the Real Deal eClub and receive a free entrée. Sonic Drive-In: Free cone with text sign up. Spaghetti Warehouse: Free appetizer, birthday meal; free dessert with text signup. Starbucks: Free drink for signup, on birthdays and free refills. Taco Cabana: Enjoy a free fajita taco when you sign up for TC rewards. Texas Roadhouse: Get a free appetizer when you sign up for this restaurant’s email list. TGI Friday’s: Sign up for your choice of a free appetizer or dessert on your next visit. Tilted Kilt: Join the Kilt Clan and receive a free pub pretzel plus a free burger on your birthday. TooJay's Deli: Free dessert with rewards signup. Uno's: Free dessert with purchase. Village Inn: Get a free slice of pie with any adult entrée purchase. Waffle House: Free hashbrowns by joining the e-mail club. Wendy's: Free single and deals with app download. Wild Wing Cafe: Sign up and get a free appetizer. Wingstop: Join The Club for a free order of fries on the house. Yogurtland: Get a free 3-oz frozen yogurt when you register for a Real Rewards account. Zaxby’s: Join the Zax email club and receive a free sandwich meal.